EMPAC Fellows have presented at the European Society of Criminology’s prestigious Annual Conference. Previous conferences have been held at locations across Europe from Porto to Prague. The 2017 conference, held in Cardiff, is the first time the event has been held within an area policed by one of the 43 English and Welsh territorial police forces. Held from the 13th to 16th of September 2017, the conference drew in attendees from across the world keen to hear the latest in crime research. The fellows spoke shortly after a plenary on ‘Challenges Facing Policing and Criminal Justice in Contemporary Europe’, delivered by Rob Wainwright the director of Europol, Matt Jukes the Deputy Chief Constable of South Wales Police and Jorg Monar from the College of Europe. The event also attracted speakers and delegates the Home Office, the National Crime Agency and research institutes across the world. Three of the EMPAC Fellows, Alex Paradise of Derbyshire Constabulary, Liz Perry and Mo Behl of Leicestershire Police made up the majority of the small number of presenters from UK territorial police forces at the conference. Presenting to an international audience, the fellows spoke about the research they are conducting through the EMPAC fellowship. The diverse topics ranged from the psychology of the Special Constabulary, the protection of domestic violence victims and preventing drug-related harm in the night-time economy. The three were introduced by Dr Becky Thompson of Nottingham Trent University before delivering talks on their proposed research topics. “It was a real privilege to be invited to speak at a European Conference. Over the four days I had a chance to meet researchers, trainers and police officers from across Europe and beyond. It was great to be able to speak about the research I will be conducting and field questions from researchers who are experts in the field. I also learnt quite a lot at the conference on a range of topics, from cyber offending to domestic violence and drug trafficking. The highlight for me was listening to a panel on Criminal Networks and Cybercrime. This included talks by Johnathan Lusthaus, the Director of the Human Cybercriminal Project at the University of Oxford and Edwin Kruisbergen from the Dutch Ministry of Security and Justice. Having a researcher and someone directly involved in cyber investigations gave the panel different perspectives on the topic. It was interesting to learn about some of the identified bottlenecks of cyber offending which create opportunities for the police”. 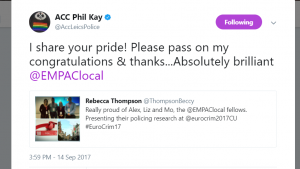 “It was fantastic to have an opportunity to talk about the policing research being conducted through EMPAC and to introduce my study. I enjoyed helping present the positive impact that the organisation is having by developing researchers. I enjoyed going into an unfamiliar environment and the experience has really helped develop ideas I have about how research could be implemented into my role in the future”. “Attending Cardiff for this conference was a really interesting experience. I can’t imagine if I would have ever done something like this if I had not been part of EMPAC. I had a chance to listen to some cutting-edge research into domestic violence and other topics, which I think will give me a greater understanding of offending and victims. I hope to take this experience and use it to help me in my day job. It was also interesting to hear the other researcher practitioners speak. Whilst there are similarities and differences between how each of us view the future of evidence-based policy in policing, it has been great to spend time with likeminded people who have a positive view of the future of policing”. The 18th Annual Conference of the European Society of Criminology will take place in Sarajevo.